I have seven of these trees in my yard. With no issues till now. They are 2 1/2 years old and we are coming off a vet wet winter season. Two of them have developed a lot of brown needles starting at the top of the tree. What can I do for these trees. 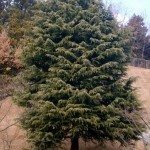 Cedars do this naturally when they are young and during the second or third growing season. However, if you notice needles turning brown during the summer or winter, your tree could be infected by spider mites.